The Public Security Ministry (MSP) confirmed that it will build a police station in the coastal town of Puerto Viejo, in the Caribbean province of Limón. Vice Minister and National Police Director Juan José Andrade said at a news conference on Tuesday that the ministry has allocated the required funds for the design and construction of the station, and expects construction to begin soon. The MSP announcement comes just days after the murder of Bruce McCallum, a Canadian tourist who was stabbed to death in Puerto Viejo – most likely during a mugging, the Judicial Investigation Police reported. Local residents found the body in the early hours of Sunday lying on a street. The man had told members of his group that he was interested in shooting the sunrise at the beach. The announcement of a new police station is part of the ministry’s actions to improve surveillance in the Caribbean region. 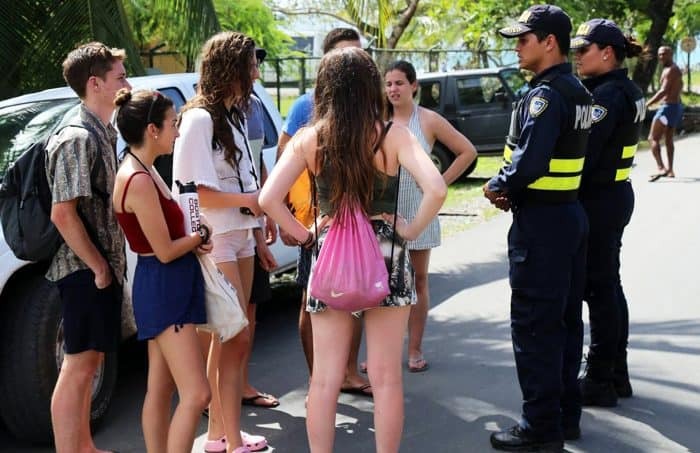 On March 10, Vice Minister Andrade disclosed the details of an increased patrolling plan during a town meeting in Puerto Viejo. Starting this week, 40 National Police officers joined another 40 who currently patrol the Cahuita district. Andrade said that during the next 100 days these 80 officers will patrol around the clock. At the end of that period MSP will decide whether to extend the increased surveillance plan. Officers are currently conducting foot and bike patrols. They also are setting checkpoints along the road and performing intelligence work in various areas, Andrade said. Others are conducting surveillance in various communities with the help of two mobile police stations. Police officers during foot patrols are handing out information about safety measures and talking to residents, business owners and tourists. “We guarantee police presence by air, sea and land. National Police and Tourist Police officers are working closely with local entrepreneurs and residents,” Andrade said. Increased surveillance also includes sea patrols along the coastline, mostly aimed at detecting boats transporting drugs, Andrade said.